Pet owners often wish their dog could talk and tell them when they are in pain. Like people do sometimes, even if your beloved pet could speak to you, he might try and hide his pain. Dogs have a natural instinct not to show weakness, so they often literally grit their teeth and try to wait out illness or injury. Communicating with them is a great way to open the channels to true understanding where you can discuss pain, concerns and get their direct feedback. However, not everyone knows how to communicate with animals, yet. And that means you have to carefully monitor your pet so you will know when he needs your help. While limping is an obvious sign of injury, a slow and hobbling gait may indicate something more than simply a sore paw or a strained muscle is wrong. If your usually mobile pet suddenly doesn’t want to go for a walk or avoids the stairs, she is probably in pain. A trip to the vet is in order to check for injuries or chronic conditions like canine arthritis. Your pet may show pain-related agitation in a number of ways. He may be restless, pacing back and forth continually. Trembling is another indication of agitation and may signal that he is hurting. If your pet is panting for no obvious reason or has an elevated heart rate, pain may be the cause. While a variety of things can put humans off their food, dogs can eat through most anything. If your pet suddenly rejects her kibble, she is most likely ill. As you know, dogs love their food, so a lack of appetite needs to be taken seriously. Your dog’s eyes are a window into his health. If the eyes are red and irritated or your pet is squinting, he is possibly hurting from illness or injury. While your pet can’t speak, she can bark, whine, howl and growl. If your dog becomes extra noisy, she may not just be annoyed by the cat. She may be in pain. Your animal’s pain needs to be explained, and unless he has an open wound, you will need help with a diagnosis. Schedule a trip to the vet. The vet will look for signs of disease, such as cancer, gastric upset or muscle injury. The vet can also determine if your pet has arthritis, a condition common in older dogs. Once your pet has been diagnosed, the vet can prescribe medication to ease his pain. Often, you will offered a NSAID such as Carprofen to give your dog. Click here to read more on how this anti-inflammatory works to prevent swelling without causing harmful side effects. Your dog may also be offered opiates in some occasions, although vets are reluctant to use them because of the debilitating side effects. You should say no to these unless there are no other options. Your pet can develop a tolerance to them and need more and more to get the pain relief he needs. Steroids can also be used to control inflammation, but the vet will probably only use them if an NSAID doesn’t work. Some vets will also try antidepressants and nutraceuticals to reduce pain. Steroids are a short term bandaid designed to give your pet time to heal and some relief, but it’s important to get to the bottom of the problem and affect true healing at the core so the problems don’t return. You know your pet better than anyone, so if you think your dog is suffering, he probably is. Take your pet to the veterinarian for evaluation. Animal medications and treatments have evolved in recent years, so your pet doesn’t have to suffer from untreated pain. 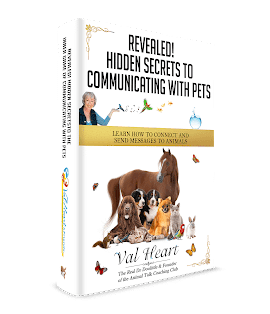 If you are not sure, then take time to listen to them by hiring a professional animal communicator. When you find out for certain if they are in pain, what makes things better and what makes things worse, then you’ll have a better idea what to do on their behalf. Is your pet sick? Suffering from illness, chronic pain or mystery lameness? Don’t panic. Even if your vet can’t figure out how to help your pet feel better, there’s a lot you can do to turn things around. Help is on the way. In working with me, not only will you know how your pet feels, where they hurt, what helps and what makes things worse, you’ll also have a customized plan to help them feel better fast. You’ll know what to do every day to help them ease the pain. You’ll both start feeling better with One Heart Healing Programs.